© AFP/Getty Images Fighters from the Syrian Democratic Forces attend the funeral of four fellow fighters in Qamishli. 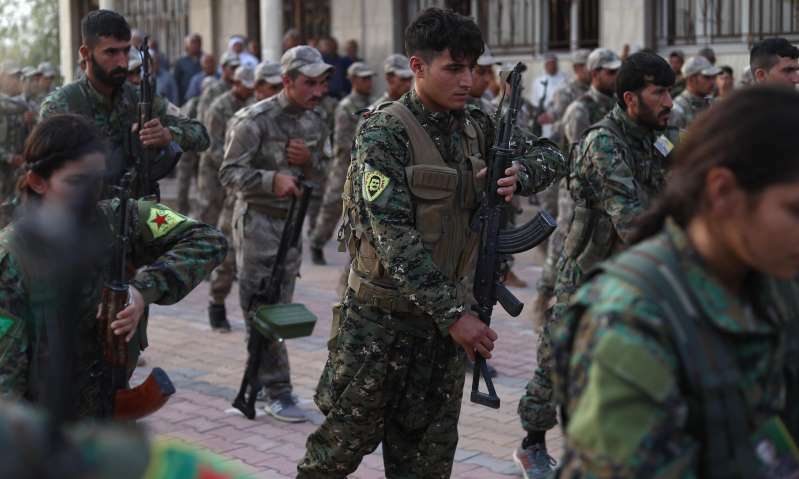 But Kurdish prisons and displacement camps housing suspected Isis fighters and their families are already overstretched, said Abdel Karim Omar, co-chair of the Kurdish foreign affairs committee in Qamishli, the Kurdish administrative centre in Syria. The calls for international partners in the fight against Isis to ease the strain on their Kurdish allies comes as news emerged over the weekend that the SDF had captured three foreigners suspected of being Isis fighters – British citizen Anwar Miah, a pharmacist from Birmingham, as well as one Spanish person and one Italian national. Omar said 520 foreign Isis fighters were currently in Kurdish custody, and Human Rights Watch estimated about 2,000 women and children with links to the group from more than 40 countries were being held at displacement camps. Almost all remain in legal limbo. Only the US, Russia, Sudan and Indonesia are publicly known to have taken back citizens with Isis connections, but only 60 people have been repatriated in total. At least four British men are known to be held in Kurdish and US-run facilities in Syria at present. “Anyone who has travelled to these areas against UK government advice, for whatever reason, is not only putting themselves in considerable danger but also under suspicion,” a Foreign Office spokesperson said. Earlier this year, UK efforts to extradite the two surviving British members of the terror cell known as “the Beatles” to the US, El Shafee Elsheikh and Alexanda Kotey, were suspended pending a legal challenge against the Home Office’s unprecedented decision not to seek assurances from Washington that the pair would not face the death penalty. The new captures have raised questions over how many Isis fighters remain at large in Syria’s vast eastern desert, where members of the group fled after being defeated and driven out of their de facto capital of Raqqa almost a year ago. A UN report last month said between 20,000 and 30,000 militants were active in the desert territory on either side of the Syrian-Iraqi border, but several analysts believed the estimate to be too high.